There is a topic that is taboo among men. And their wife often brings up to them. The cost of living has gone up so much that, on the surface, not having two income seems impossible for survival. If you do not have a dual income, you can’t even save adequately for retirement. This week, I read this research piece on Why Two Incomes Aren’t Always Better Than One on Kitces.com. I read with glee, hoping for some figures that challenge my thinking that single income in this time and age is impossible. I came away with some new considerations but largely held the same view. My view is: One spouse can stay at home, but both spouse must pre-pay for this stay at home scheme. This is the Coasting FI or Barista FI Scheme. A household with dual income but fiscal responsible is a financially stronger household. The research is good and I urge those that are interested in this subject to read it. However, if you find it hard to read, I have summarized the main points below. We often assume that having a dual income household would always offer more stability as a unit compared to a single income. This dual income stability is best illustrated when one spouse loses their job. There is another spousal income that buffers the loss of income. In contrast, if you are a single income household, you face a lot of risk. In US Senator Elizabeth Warren and her daughter’s book The Two-Income Trap (before she became a senator), they state with evidence that a 2 income household is more prone to financial hardship than a single income household. The argument is that a single income household have in history, provide stability when the non-working spouse go into the work force when the family face financial hardship. The reduction is less for the single income because the non working spouse went back to work. This works out because the single income household has a smaller base to reduce. I find this very befuddling in logic, since if we look at the monetary angle, it always make sense to earn more than less right? The only plausible reasoning is that this is not the only consideration, but paired together with other benefits, which we will explore. Having only 1 income puts a constrain on how much your household can spend. Due to that, the household tend to be constrained by that limited cash flow and not spend freely. In contrast, as there are greater cash flow, a dual income family tends to abuse the larger amount of cash flow. The primary area of abused are in expenditure that is more fixed such as vehicles and homes. When the sole breadwinner in a single income loses the income, you will think it is a terrible event. The contrarian thinking is that because they watch their spending as a single income, it makes it easier for them to manage. They also took on less risk in their spending choices during normal situations. The dual income household, due to having more income, tends to not watch their spending, and when the main breadwinner loses the job, the impact is greater because they get so used to having much more cash flow that the do not plan well with a stricter cash flow. The previous section’s situation for dual income household won’t happen if a dual income household can just live on 1 spouse income. The data shows that as income increases, lifestyle creep also occur. However, Senator Warren and Daughter’s research into dual income versus single income over time shows that discretionary or “optional” expenses actually went down, as their income increases. What caused the bulk of the increase was fixed expenses, notably home mortgages. The data shows that the causal factor could very well be that parents would bid up homes near schools they want to get into. Thus, they are not spending frivolously but are daring in their allocation to fixed expenses. This phenomena might not happen in the Singapore context. 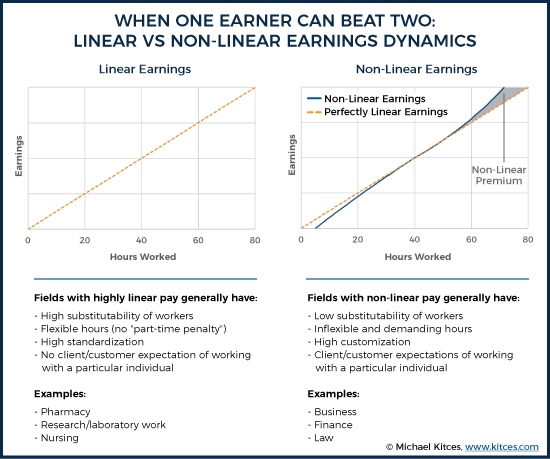 The research argues that there are some profession where top performers can earn income that is non-linear to the amount of time they commit. When the person puts in double the effort, their chances of getting promotion, and out-sized gains in their remuneration is also higher. 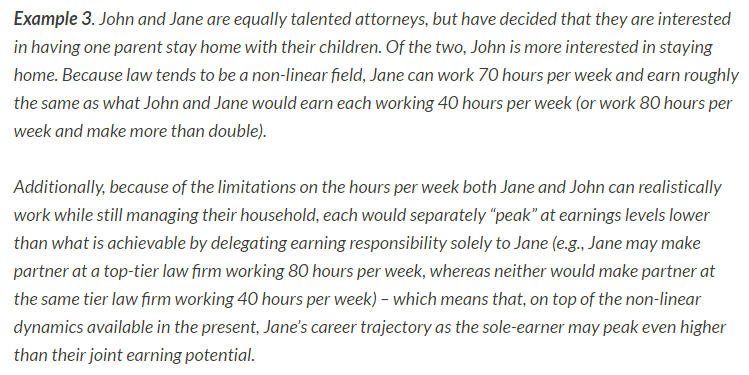 In contrast, due to the equal commitment to family, a dual income household would not be able to develop their career such that this non-linear income can be reached. The table above illustrates the characteristics of these profession. The non-linear growth in income because a single spouse can devote time and effort would eventually outweigh the income of 2 above average worker in the same field. Think of it as a single person whose spouse can concentrate on bringing up and educating the children safely and the other spouse became an IT Director, who commands double the pay if the couple takes equal share of responsibility. All else being equal, if the household have less fixed expenses, the amount that is required for emergency funds is lesser. If the spouse job scope is more of a bond than an equity, a smaller amount of emergency funds is needed. If one or both spouse is able to re-enter the market and secure the job, a smaller amount of emergency fund is required. The contrarian thinking is that for a single household, the ability for a spouse or two spouse to re-enter the job market and the fiscal constrain on a single income likely means a single household requires less emergency fund than a dual income household. The article pointed out that not all careers are great for the non-working spouse to re-enter the work force. We can frame maintaining the non-working spouse’s human capital as a sort of emergency fund. The article emphasize that a single household have more pronounced risks. Life insurance and Disability Income Protection is Important. If the single income breadwinner loses his ability to earn a income, this would severely impact the household. If the stay at home spouse loses his/her ability to earn as a reserve human capital, during troubled times, they will lose some stability. The problem is that getting disability income insurance for the stay at home spouse might be difficult, and even if insured what would be the payout for a person not earning any income? Life insurance is necessary in that in the even any spouse passes away, you either need to replace income or increase resources to help out the household due to the household void. One of their premise why cost for a dual income household is greater is because they tend to bid up homes of good schools. Their solution is that, if one of the spouse stays at home to home school the children, this allows the family to stay in a crime free location so this would keep home affordability manageable. Home schooling is not prevalent in Singapore and in this context, it might be less applicable to Singaporeans. As the couple’s human capital diverge, you can see the risks increasing for the spouse that stay at home. The spouse would have to be wary of any pre-nuptial agreements that reduce his/her ability to lay claim to the other spouse or family assets. I generally find this article a good read by exploring angles that I have not thought about. However, I find that it did not explore the idea that as a household, the savings on taxes and benefits derive by having a spouse not working in USA isn’t explore. I heard about this and the taxes paid could cancel out a large amount of cash flow to negate the benefits of dual income. This, together with some of the advantage of being there during your kids critical years, are some of the main arguments why a single income household is not always worse off. 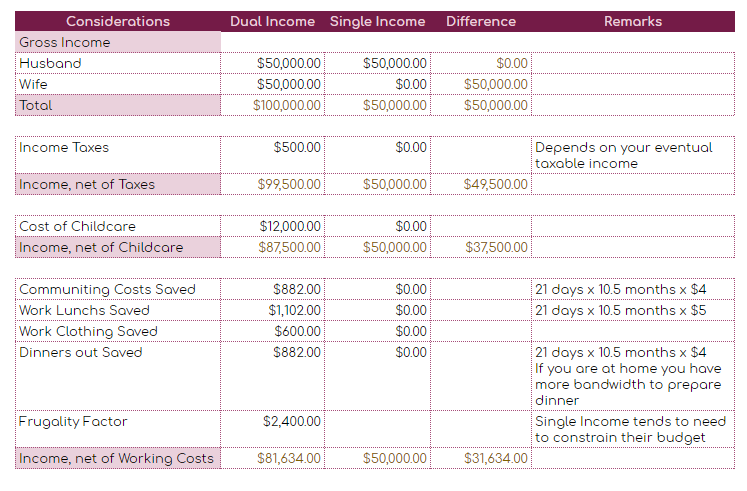 The above template is a rough one that tries to itemize, and let us reflect upon the differences between a single income and a dual income. It is very rough, and there might be some stuff that is not factored in (I welcome the single income readers as well as the dual income readers to educate me). Your mileage will vary as well. I tend to find that cost savings is not a lot, but its the intangibles such as spending more time with your child at the critical moments of their life. Your mileage may vary. The biggest difference seems to be the disparity between the wages of both spouse. Or rather, if the spouse that voluntarily chooses to stay at home was a high earner, the difference is big. I do have peers whose spouses earn $36,000 and below. In this case the intangibles might outweigh the positives. I generally find that the classification to be pretty general. I agree that dual income tends to encourage lifestyle creep, but more from the angle that there are more fiscally restrained consumption choices that a couple could take. This will only be forced upon a couple if money is constrained. I do see high powered couple who end up climbing high in their career and due to the high dual income, have a lot more resources to provide help to bring up children. The idea this article tries to drive home in this area is that something has got to give. You cannot have everything. Living on a single person’s income is tough but could you do it? Tree of Prosperity’s Chris Ng stated that in general it is more likely that a family lives off 1.6 times the main breadwinners income. How much do you think this research matches the Singapore context? Let me know. I enjoy the articles you put up very much over the last couple of years. This is the first time I am posting a comment. While I think it is possible to live on one income, one do need to constraint our spending and have a clear understanding on needs vs wants. I think most couples in Singapore miss the big picture cos’ they really don’t know what is important to them. They blindly chase after the car, condo, titles because they believe this is what they really want, without considering that it was societal conditioning and our government efforts to ensure that you continue to pay a very high taxation (think land sales cost of your condo, COE, GST, gasoline taxes) over your working lifetime. If you do the math, you will be shocked at how much a couple making 200k per year total pays in income tax if they stay in a $1.2mm condo and drives a 130K car. But I digress. The reason why I am posting is because I know it is entirely possible to be financial independent and retired if you and your spouse can both work for about 11 years and spend less than 50% of your income. It is possible as my wife and I live on less than 40% of my income while I was working and we were both able to stay home to care for our boy…. at any one time in his 14 years, there is always a person at home full time with him. 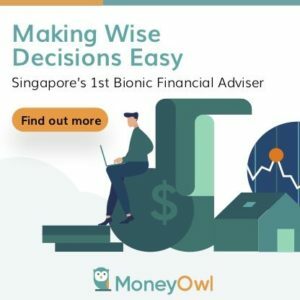 Now that I have reached FIRE, I think it’s important for more Singaporeans to find a way out of the rat race early so that they can really spend time on things which are truly meaningful to them. I really appreciate all the effort you put up in your blog. It is very well maintained and your analysis is always very clear headed. Thanks for sharing your experience. From what you have said that formula does add up if your income is high enough, and you keep your savings rate high at more than 50%. the timeline seem to be 11-15 years from the time that you start. So was financial independence worth while or there were some negative learning lessons there. Would also love to find out the extend of tax people paid for those two items. Thanks for taking the time off your busy schedule to reply. Life after FIRE is fine, as there are things I like to do – spend time with family, read, exercise, volunteer etc… The only downside is that almost all my other friends are still working and hence I take the time to meet them for lunch near their office – 1-2 lunches a week with different working friends. At 3.5% SWR and with a portfolio of ETFs which should generate 7% compounded and low DD (think <3% in 2008) during downturns due to the asset allocation I have chosen, I can sleep soundly at night without looking at the market for weeks on end. Checkout Portfoliocharts to have a better understanding on asset allocation. One of my friend who is on track for FIRE introduced me to it. There are a couple of blogs which I highly recommend – mrmoneymustache.com and portfoliocharts.com (other than your blog of course). Regarding the taxation, with your clear-headed analysis, you can work it out of a piece of napkin. The taxation I am talking about on condos are land sales (which the developers pass on to you). This is basically a "pass-on" taxation (or hidden government income tax like I call it). Nothing wrong with that though I know most of my condo dwelling friends do not think of it from this angle. For cars, think COE, gasoline tax, car parking etc…. Once you do the math, you may be surprised that once you drive a car and live in a mid-range condo, you may be paying between 30-40% taxes over 20-30 years instead of the "low sub 10% range" due to all these "hidden consumption" tax. Our time on this precious earth is limited… and every day we spend working to pay off that condo/car etc.. is one less day to focus on the really important things in life (this of couse differs from ppe. to ppe.). Like the saying goes "Why do we buy stuff with money we don't have to impress people we don't care about? ".